I guess even back in the primitive days of spinning discs and spools of tape I still had to take my gloves off to pause or skip a song on my music player. Even paperback books were unwieldy. I wonder if those touch screen gloves are any good. I guess I’ll probably just stick with chilly fingers for now. I just use my nose. My touch screen gloves are amazing. I’ve found the leather ones don’t work as well as the knitted, though. 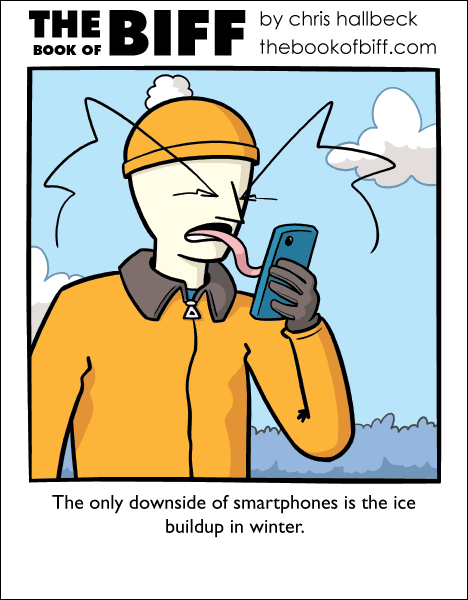 Does it really work to use your tongue on a smartphone? …Ehh, never mind, I don’t want to give it a try! What about all the bacteria on it? They would probably get scared of me! You can make your own touch-screen gloves, by just getting a thin wire and sewing an x on the fingertip of your glove. The touch screens work by conducting electricity in your skin. Yeah, I’ve been practicing with my nose, but it’s still horribly inaccurate and greasier than my fingers, which I like to have abnormally oil-free. Maybe I’ll strip a twist-tie and try Katie’s idea. “The iPhone lickable wallpaper! The Apple tastes like an Apple! The computer, not the fruit.